(i.e. Saudia Airlines, Aramco, National Commercial Bank, Islamic Development Bank, Royal Diwan And the Crown Royal Diwan, Chamber of Commerce etc.). the Alhyatt Jeddah Continental Hotel also Caters to Customer as far as Hafr Al Batin, Makkah and Taif. Almost in the heart of bustling Jeddah, 15 minutes from the King Abdul Aziz International Airport at the corner of Palestine and Settin Sts. rise Alhyatt Jeddah Continental Hotel, ideally located to many major business establishment, Consulates, airlines offices and shopping centers ( about 2 Kms. From Serrafi Mega mall and 3 Kms. From Jeddah downtown center) this is the hotel that is near to every thing. Al Hyatt hotel has 42 first class large suites, 6 medium suites and 18 luxury single rooms. The Suites has a large salon and kitchen, plus state of the art electronic appliances and climate control air conditioning unit. Al Hyatt Hotel has 24 years of management experience in hotels, building management rental sevices (for Hajj and Umra Seasons), catering and banqueting operation for banks and big corporations. Our hotel suites are fully equipped European style kitchen, we also provide direct dialing telephone facility from the Rooms. Laundry Service in the same day is one of our remarkable facility. 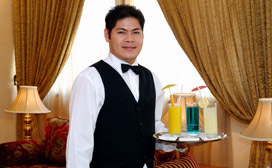 We have round the clock Room service available to all our guests, additionally we provide Daily House Keeping Services. Our Satellite TV Network has more than 30 channels. We have two Banquet Ballrooms (Sultan & Sultana). Has all the facilities of weddings and any kind of functions has designed to accommodate up to 250 Guests. Conference, exhibition, corporate meetings and product launch. Supplied with Screen, Podiums and Slide Projector. Outdoor catering facilities for more than 1000 persons.